Let us now see why offshore wind power is such an attractive thing. There seems to be several reasons behind this marine bound power strategy. First of all, suitable land location for onshore wind power is limited in most European countries because of dense population vis-à-vis land area that is available for installation of the wind turbines. United States fortunately do not suffer from this predicament as because it is a vast country where land locations for installing turbines are not as scarce as in Europe. Secondly, strong wind resources and shallow water level in or around the shores of North Sea and the Baltic Sea offer favorable sites for installing the wind turbines. In fact, these considerations had originally made Denmark to install the first offshore wind farms that had made the country the world leader in offshore wind power. However, in October 2008, the United Kingdom gained this prestigious position with the installation of a 590 MW of nameplate capacity. Encouraged with the good results, the country is planning to build more extensive offshore wind farms within the next few years. Experience has also given the clue to most of these European nations that population centers along the coast lines, and thus it is ideal for the distribution of power from offshore wind parks that greatly reduces the transmission costs as well as transmission loss. Some of the factors that facilitate installation of offshore wind turbines include transportation of wind turbine components like tower sections, blades, nacelles, etc over water than on land because ships and barges with their inbuilt cranes can handle such heavy and cumbersome cargo that trucks or trains prove difficult to haul. In fact, extra large goods vehicles capable enough to carry unwieldy turbine components cannot negotiate sharp road corners and they cannot also move from one point to another without causing damage to their precious cargo. A barge, on the other hand can almost turn on its own axis to unload it cargo at any desired spot. And this often becomes crucially important. However, as the cost of construction as well as maintenance for each wind turbine is much higher for offshore wind farms, the operators naturally insist on lower number of turbines that are higher in capacity. Belgium’s Thorntonbank Wind Farm may be considered as an instance following this principle where 5 MW wind turbines from REpower are going to be installed soon. These are considered to be largest wind turbines ever commissioned. Princess Amelia Wind Farm, an offshore Dutch wind farm created history on December 21, 2007 by way of transmissioning offshore wind powered electricity to a Dutch grid. The 120 MW offshore wind farm with a construction budget of Euro 383 million was the first to be financed by a non-recourse loan that comprised sixty Vestas V80 – 2MW wind turbines. Each turbine’s tower was made to rest on monopole foundation to depths ranging from 18 to 23 meters and located at a distance of 23 km off the Dutch coastline. Installing an offshore wind power system may be however more difficult for the home user. If you want renewable energies in building, you should know how to build a wind generator and install one at your home. Here is a manual that will help you step by step – it will teach you where you can set it up at the home and how to install it, how to complete the wiring, where to get the parts from cheaply and also the safety precautions. 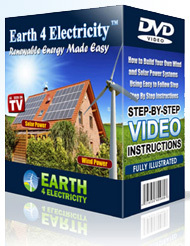 Cheap wind power is a great idea because it is a clean energy and also because it helps you save on your power bills.